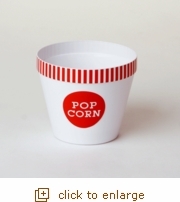 Our new color rimmed popcorn buckets are individually sized - perfect for tiny hands or smaller servings! Each bucket holds approximately 2 cups of popcorn and measures 5" across the top and is 4.5" tall. Coordinating large buckets are also available for only $12.99!